Bonita J sent me these beautiful earrings to review! They are totally customized. I picked out the type of hook to use, the color of pearls, and the color of the crystals. This is really a neat thing to be able to do especially for weddings when you may want the earrings to match your dress or your bridesmaids dresses. I chose to review the Carissa Crystal and Pearl Linear Drop earrings. They retail for $21 if you buy one but if you buy more like 3-5, you get a discount! 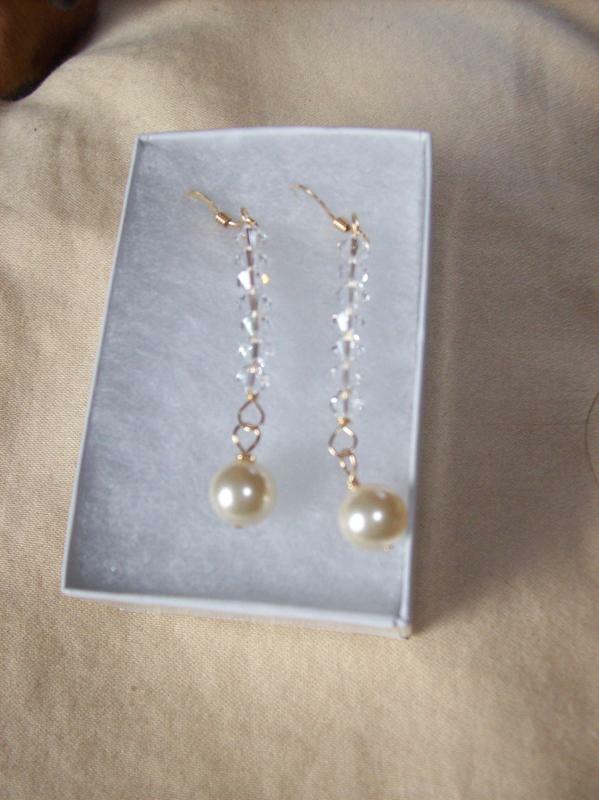 Here is a little info about the earrings "The Carissa Crystal & Pearl Linear Drop Earrings are an elegant pair of Swarovski pearl and crystal earrings. With a line of Swarovski bicone shaped crystals that have an elegant pearl drop, this pair is versatile and can be worn for many different occasions." The company sells wedding jewelry, bridesmaids jewelry, and bridal jewelry. There are many stunning options for weddings or any other occasion really! I really like my earrings and will be able to wear them a lot! The giveaway will be for one $25 gift certificate to Bonita J! The giveaway is open until Midnight on Monday November 29th. Winner will be chosen on Tuesday November 30th using Random.org. Visit the Bonita J website and let me know what you would choose if you won this giveaway! -Like Bonita J on Facebook (1 entry). -Follow Bonita J on Twitter (2 entries). -Subscribe to the Bonita J mailing list (3 entries). i so much adore the http://www.bonitaj.com/biancae-prod.html (bianca bridal earrings). hope to win! I absolutely love the Audrey Pearl Drop Necklace - it's totally perfect for my wedding and beyond! now following on Twitter @Jaxx317! entered the 5 Rapture Fashions giveaway! liked your Facebook page (via Jackie Peterson)! entered the downeast basics giveaway! Cubic crystal bridesmaid earings are my choice. i would get the Small Diamond Drop Bridesmaid Crystal Earrings! I love the Cubic Crystal Bridesmaid Jewelry Set. #1 I subscribed to Bonita J mailing list. #2 I subscribed to Bonita J mailing list. #3 I subscribed to Bonita J mailing list.